As craft beer enjoys a full embrace by the mainstream, beer menus at Seattle’s best restaurants are becoming as widespread and sophisticated as wine lists, with the pairing of beer and food now a more common part of the fine dining experience. But beer is a humble beverage and does not renounce its modest past, a time when the term “beer and food pairing” typically featured something cheap, maybe deep-fried, and delicious. Below, we present a selection of must-try beers along with suggestions for more traditional pairings—including pizza, burgers, and fish and chips. You’ll think this beer, brewed in Seattle’s Interbay neighborhood, was infused with oranges and mangos, but that’s just the hops shining through. Hop flowers are referred to as cones and are dried in a kiln, so this beer’s name indicates that the hops steal the show, with fruity flavors deeply woven into the richness of the beer. Available on tap at the brewery’s tasting room and at better beer bars around Seattle. PAIRS WITH: A spicy pizza, like the Mole from Bambino’s Pizzeria in Belltown ($12 small, $18 large). Allow the beer’s hoppy character to accentuate the rich, spiciness of the Salumi mole salami. Get your pie to go and take it to Holy Mountain’s 21-plus taproom, just a few minutes down the road—they don’t mind. It’s an oft-ignored beer style, but when properly executed, porter is one of the best beers to pair with food. Stoup Brewing’s version of this traditional English-style ale is dark and robust yet delicate, with a smooth, malty sweetness balanced by mild hop bitterness and just the faintest hint of smoke. Available on tap at Stoup’s all-ages taproom and at better beer bars around the city. PAIRS WITH: A rich, savory pizza, like the smoked wild boar and pineapple pizza ($14) from The Pine Box, Capitol Hill’s adults-only beer mecca. 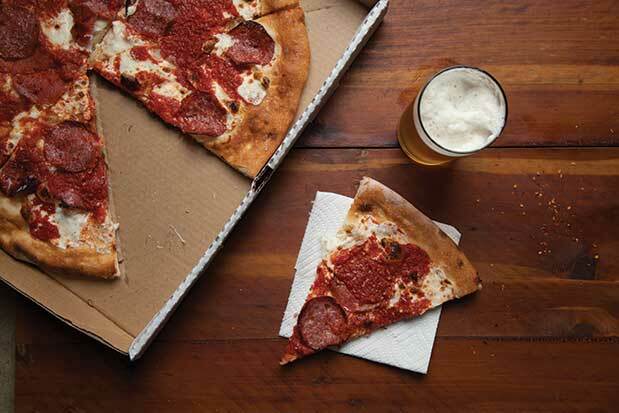 This toothsome Ballard-born brew, which often appears on the beer menu here, stands up to the richness of the pizza, and the smoked meat helps awaken the smoky notes in the beer. Stoup porter is often on tap here, but if it’s not, get your pizza to go. Don’t let the name deceive you, this brewery is not located on Queen Anne; rather, it’s just off Michigan Street in Seattle’s Georgetown neighborhood, where its family-friendly taproom opened last February. The brewery’s name refers to the balanced formulation of a good beer recipe, and its Bad Wolf dark ale is a perfect example of the philosophy. Defying simple definition, it is aptly described as a strong, not-too-sweet and not-too-hoppy dark ale. PAIRS WITH: Sip this one as you munch on a lush, earthy pizza, like the classic mushroom pizza ($12.50) from The Masonry, Lower Queen Anne’s beer-minded pizzeria. The intensity of the beer, with flavors reminiscent of chocolate, licorice and roasted coffee, complement the earthiness of the pizza’s cremini mushrooms, garlic, olive oil and thyme. You’d be lucky to find it on the constantly rotating beer menu, so get a growler of Bad Wolf ale at the brewery’s taproom and enjoy your pizza at home. Hailing from Hood River, Oregon, this 3-year-old brewery is young but highly revered and decorated, with many awards and medals to its name, which is pronounced “freem.” pFriem pilsner perfectly represents the brewery’s reputation for balancing tradition and creativity, taking an age-old European style and combining it with New World flair by adding a spicy and floral, but not overwhelming, hop character. PAIRS WITH: A bold pizza, like the caramelle pancetta (pancetta, caramelized onions, bacon and blue cheese; $19) from Watershed Pub and Kitchen at Thornton Place, near Northgate Mall. Instead of trying to match the pizza’s flavor intensity, use the light, brisk character of this beer to cut through the richness and reset the palate before each bite. If the pilsner isn’t available on tap, get the pizza to go and score a bottle of pFriem at a local bottle shop or quality grocery store. When one of Ballard’s beloved breweries created a beer exclusively for Zeeks Pizza, it pulled no punches, crafting an unflinchingly hoppy pale ale awash with tons of citrusy, fruity hop character. Typically, these kinds of “brewed exclusively for” beers are unremarkable, but last spring Hop Tropic won a silver medal at the North American Beer Awards, adding to the brewery’s impressive list of accolades. PAIRS WITH: A sweet and fiery pizza, like the Cherry Bomb ($16.95/small, $19.95/medium, $24.95/large), available at any Zeeks location or have it delivered to the Reuben’s Brews all-ages taproom, and let the hop bitterness ignite the flavors of the Italian sausage and sweet-hot roasted red peppers. Hop Tropic is only available at Zeeks Pizza locations and at the brewery’s new, larger taproom, which opened in May. After a brief respite, South Park’s Burdick Brewery reopened its all-ages taproom last winter with a refreshing, Zen-like philosophy that beer does not need to be complicated, it just needs to be good. Designed to go down easy and invite conversation instead of contemplation, this beer charms the palate with clear, unmuddled flavors that are politely piquant, like tropical fruit jam sitting atop a light cracker, and then finishes dry and clean, inviting you to order another. Enjoy it seven days a week at the Burdick Brewery taproom and at better beer bars around the city. 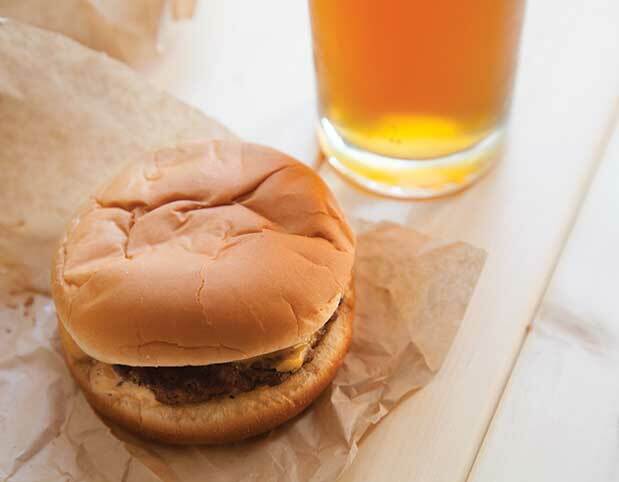 PAIRS WITH: A simple burger, such as the Tavern burger ($3 à la carte) at South Park’s Loretta’s Northwesterner. This cozy, grown-ups-only spot, follows a simple philosophy when it comes to burgers: Don’t mess it up, just make it the right way, with a toasted bun, diced onions, pickles, cheese and Thousand Island “secret” sauce. One option is get the burger to go and head to the Burdick Brewery taproom just a few blocks away, where outside food is welcome. The beer glows with a dark red tinge, or patina, but there is nothing funky about this approachable ale from one of Seattle’s newest breweries, which opened its 21-and-older tasting room last spring in Lake City. Hellbent Brewing proves that red ale (also called amber ale) need not be boring and can appeal to even the more sophisticated beer drinker by balancing a soft malt backbone with sharp hop edges, mingling the richness of toffee with piercing floral resin. Available on tap at the brewery’s tasting room (pints and growlers) and at better beer bars around the Seattle area. PAIRS WITH: A luscious, robust burger, such as the OMG burger ($8.60) at Ballard’s Giddy Up Burgers & Greens. Let the beer wash down the richness of the Gruyère, caramelized onions and sautéed mushrooms, cleansing the palate with each sip. If you’re lucky, Funky Red Patina will be on tap; otherwise, get a growler at the brewery’s tasting room and get the burger to go. A recipe literally carved in stone more than 5,000 years ago proves that the Sumerians were among the first people to brew beer, but Woodinville’s Sumerian Brewing is anything but ancient, having opened its brewery and all-ages taproom last spring. Sumerian’s India session ale immediately captured the attention of local hopheads, with its piney aroma and a crisp, biscuit-like character thickly blanketed with the hops’ bracing, tangy bitterness. Available at the brewery’s taproom and at beer bars around the Seattle area. PAIRS WITH: Beer-batter-dipped fish and chips, such as the Alaskan cod and chips ($13) at Stout, Capitol Hill’s upscale, beer-focused, but still kid-friendly pub. Skip the splash of malt vinegar and let the orange and grapefruit notes in the beer complement the clean, uncomplicated flavor of the cod. Pick up a growler at the brewery and then order your meal to go and enjoy it in the comfort of your own home. The Pacific Northwest is one of the world’s leading hop-growing regions—the Yakima Valley alone produces 75–80 percent of America’s annual hop crop—so breweries often use the term “Northwest” to indicate extra hop character in a beer. A traditional English-style brown ale is usually mild and malty, but Spokane’s No-Li Brewhouse’s twist is pungent with resinous pine notes, and has a bright, vibrant quality that complements the malty sweetness. 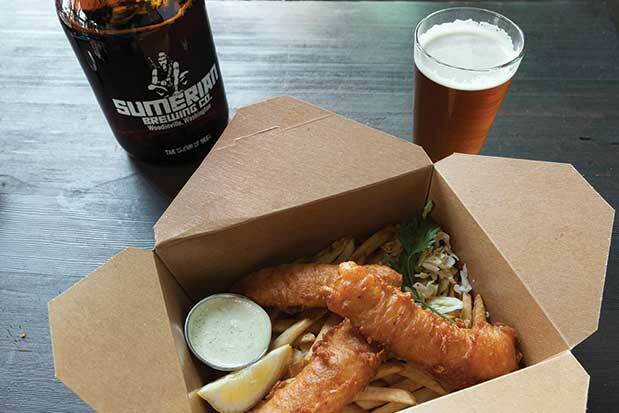 PAIRS WITH: Quaff it alongside a less traditional order of fish and chips ($12), like you’ll find at Marination Ma Kai, where they riff on an English tradition, adding their signature Korean-Hawaiian flair to the dish by serving it with miso or kimchi tartar sauce and ponzu vinegar. Sumptuous and nectarous, this beer can withstand a barrage of crazy flavors. If it isn’t available on tap, pick up a six-pack at a local bottleshop or quality grocery store and get your fish and chips to go.